Ionic 2 is catching up fairly quickly and Salesforce is not far behind on writing wrapper and plugins to match ionic framework updates. We recently started playing with ionic 2 for building Andriod and iOS application and to kick start I found neat blog written by my ex- colleague +Christophe Coenraets here , you will find him, writing on fledgling tech all through the time. 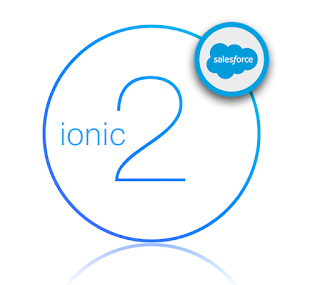 Trialhead have written a module for kick start on ionic 2 with Salesforce data resource. Since I have finished few module and went through building few applications, I am share basic step by step guide to run through and write your first up and running using ionic and mobile sdk over Salesforce. Pass on your org credentials and verify authenticity though passcode that you might receive on your registered email and if went successfully you can see application running on emulator smoothly. Salesforce have cross origin reference restrictions so it will not allow a locally hosted application to make a server level API call to salesforce and for that you need a proxy server running to make a call for you. You can use Force Server which comes in package of Proxy Server and Local Web Server. +Taiki Yoshikawa have added a github repository, do check out for bootstrap code and tune in on your machine !